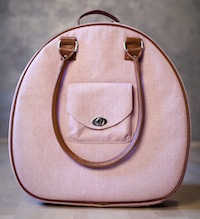 I just saw these on CareerBags.com - totes and carryalls from Tepper Jackson. Do you love the colours? I LOVE the colours! This Kashmir patterned weekender/carry-all tote is my favourite. LOVE it. Not strictly for laptops - but you could pair it with one of these crazy sleeves from Isis Dei (also at CareerBags). I think this green polka-dot sleeve would be perfect.